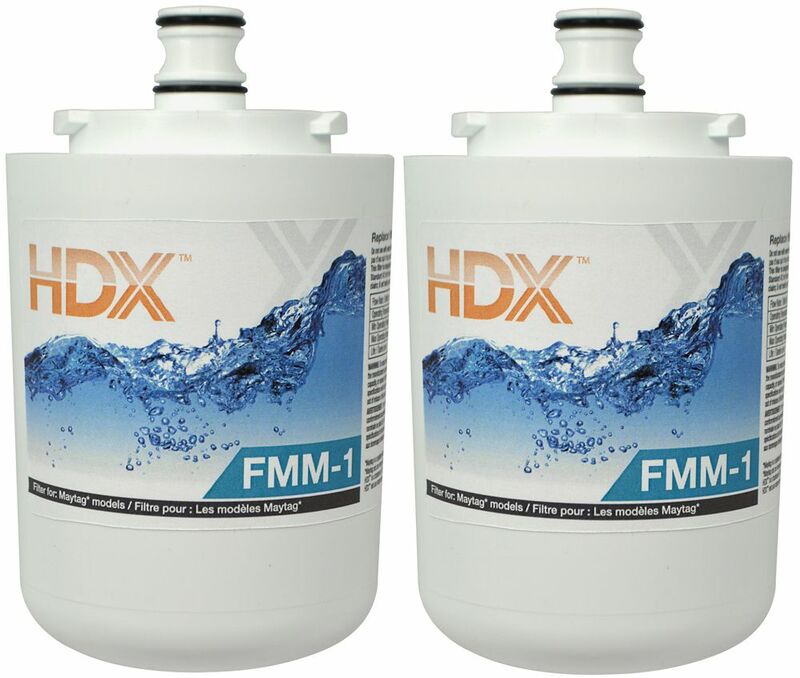 This premium HDX replacement refrigerator water filter fits in place of Maytag UKF7001. Engineered with the power of coconut shell compressed carbon block, this filter provides tremendous capacity to reduce impurities, sediment and rust that may be present in your drinking water. The carbon block has millions of active sites on its surface and within the structure which can absorb impurities like a sponge, and can hold other types of impurities on its surface like a magnet. Additionally, this filter can catalytically breakdown other impurities similar to the way a catalytic converter works in your automobile. These processes ensure that you are getting the cleanest and best tasting water possible. This economical filter will provide fresh and clean tasting water and ice cubes. The FFFD-314-2 (2 Pack) replacement filter is designed to fit all Frigidaire. PureSource Ultra refrigerators using the ULTRAWF filter. Located at the top right of the fresh food compartment and is a push/push style filter. Tested to meet NSF/ANSI standards to ensure that you are getting a safe, quality product, Fridge Filterz provide you and your family with clean, fresh tasting, odour free ice and water. Fridge Filterz are manufactured to the highest quality standard. They are designed remove Cyst, Lead, Turbidity, Mercury, Toxaphene, P-Dichlorobenzene, Atrazine, 2 4-D, Benzen, Chlorine,Particulate Class I, through the highest level particulate filtration. The carbon filter block keeps all the beneficial minerals that are present in your water. If fluoride has been added to your drinking water, it is not filtered out after coming out the refrigerator. All our fridge filters are made with environmentally friendly carbon. FFFD-312-2. FMM-1 Refrigerator Replacement Filter Fits Maytag UKF7001 (2 Pack) This premium HDX replacement refrigerator water filter fits in place of Maytag UKF7001. Engineered with the power of coconut shell compressed carbon block, this filter provides tremendous capacity to reduce impurities, sediment and rust that may be present in your drinking water. The carbon block has millions of active sites on its surface and within the structure which can absorb impurities like a sponge, and can hold other types of impurities on its surface like a magnet. Additionally, this filter can catalytically breakdown other impurities similar to the way a catalytic converter works in your automobile. These processes ensure that you are getting the cleanest and best tasting water possible. This economical filter will provide fresh and clean tasting water and ice cubes.